As previously mentioned, NHL 12 has some usability issues. For a game of its scope, maybe that’s not unexpected. There are a lot of menus to sift through for sim-heavy parts of the game like the Be a GM mode. But being able to change what players are on what line shouldn’t be that hard. It’s been in every hockey game since the beginning of time (probably). 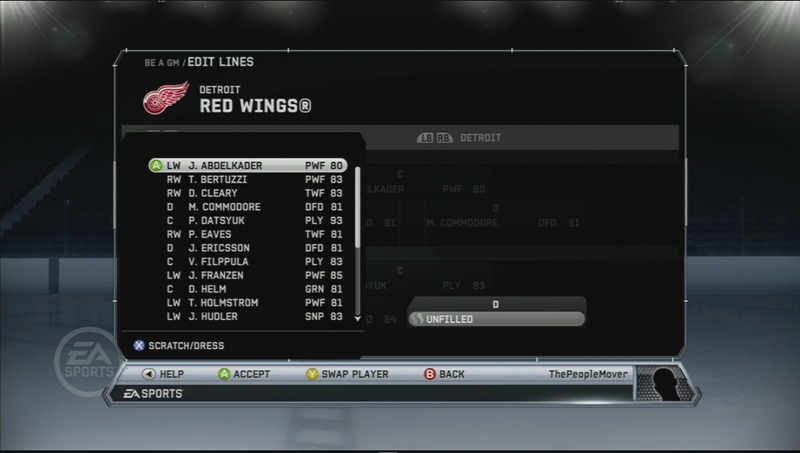 Unfortunately, NHL 12 manages to be terrible in a lot of ways on this one screen. If you’re unfamiliar with professional hockey, here’s the real basic idea: five skaters are on the ice at once, and you have four pre-made sets (that is “lines”) of five skaters each that you’ll sub in and out as the game goes on. When making updates to your lines, it should be a pretty simple transaction. If you know who you want to put in, it’s tedious but reasonable to make that happen. But here’s the problem: if you don’t know who you want to put in, the game doesn’t offer you much information to help you make that decision. All the information you get is a list of all the players on your team, alphabetically sorted, with their position and overall rating. First let’s talk about how these players are listed on the screen. Alphabetical order, that’s the best we can do? Jakob Nielsen wrote an article titled “Alphabetical Sorting Must (Mostly) Die” and that for sure applies here. Here’s one better way to sort these players – by position. If I’m filling a defender’s spot, what percent of the time do I want someone that isn’t a defender? So how about putting all the defenders at the top of the list, then everybody else under that? Taking this a step further, even better would be doing a secondary sort based on overall rating. What frequently seems to happen is I want the best available person for that position. That means I have to scroll up and down the whole list to make sure I didn’t miss anybody. First sorting on position, then by rating would be a lot more helpful. A related problem is you can’t tell who is already listed to play on a different line. Clearly, I don’t want someone to play on more than one line, so it would be awesome if the game could help me out here by giving me information when I need it! A status column, graying out of used players, there are lots of subtle ways to tell me who’s already accounted for. One more complaint here – this screen is also where you pick what players dress for the game. Players that are scratched essentially don’t “suit up” and won’t be available at all. There is a limit to how many players that you can have dressed for a game…but NHL 12 doesn’t ever tell you what that number is unless you’re breaking the limit. Usually it’s not a big deal…if you dress a player, you have an idea of who you’re going to sit to replace them. But again, a little more information like a simple counter would make life a lot easier so you aren’t trying to guess what your current state of affairs is. In Be a GM mode, editing lines is an important part of the game. You’re making deals, calling up/sending down players, lots of stuff going on with your team. Editing lines is a key component of getting your players to the ice, just like setting your lineup in baseball or your starters in basketball. It shouldn’t be this difficult! This entry was posted in Console, review, Sports and tagged game experience, gui, line changes, nhl 12, ps3, ui, usability, usability in gaming, user experience, ux, xbox 360 by mark d. Bookmark the permalink.